A few weeks ago, I stood looking bigotry in the eye and wondering how someone comes to think and behave that way. What makes it possible for someone who has feelings and some kind of sense of self-worth to treat others as though they are scum who should be eliminated from the earth? The place was the Nauvoo Pageant, sponsored by The Church of Jesus Christ of Latter-day Saints (Mormon) in Nauvoo, Illinois, a town from which the Latter-day Saints were once driven by mobs. The scene was the entrance to the pageant. Protesters and hecklers stood on the public street, just off of Church property, taunting, insulting, and confronting people arriving to see the historical pageant. I’m grateful I can rely on Jesus Christ to judge my Christianity, and not on someone who is willing to consign me to hell without knowing my heart. One man used a megaphone to shout taunts such as: “All Mormons are going to HELL!” as well as slurs like “Mormon ___________!” or “Mormon _____________!” (insert a name here for a man or woman who is gay). It was evident from his demeanor that he was using those slurs in the belief they would offend people. Not far away were a couple of other people handing out literature designed to look like it was connected with the pageant. In truth, it was a collection of criticisms, half-truths, and distortions of LDS doctrine. I have read their literature before and investigated the claims. All of those claims have either been disproved long ago, or cannot be either proved or disproved because they are misrepresentations. The people handing out this material want it understood that they are separate from the people with the megaphone; they will tell you they are simply there in the service of Jesus. I would like to ask how they feel they are serving Jesus by handing out material that they know, or should know, is misleading. Don’t misunderstand what I am saying here. There is certainly room for good people to disagree on questions such as how grace is applied in our lives, what awaits us after this life, and how we should receive and respond to inspiration from the Holy Ghost. I respect anyone’s right to have a different view. It is a basic tenet of our faith that all men and women have the God-given right to exercise their own agency in religious beliefs and practices. 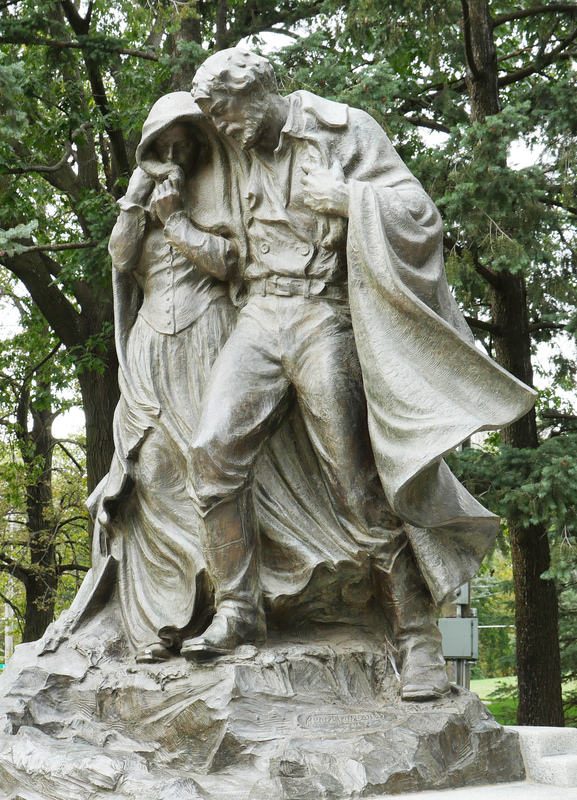 Among the 13 Articles of Faith that define basic LDS beliefs is this one, number 11: “We claim the privilege of worshiping Almighty God according to the dictates of our own conscience, and allow all men [and women] the same privilege, let them worship how, where, or what they may.” This idea is embodied in the First Amendment to the Constitution of the United States. And yet some seem to feel that this freedom should be applied only to certain selected religions. I am always grateful to be among believers in God, and I have no difficulty working amicably with anyone, whether or not they believe as I do. I respect their right to worship, or not, as they see fit. I believe we are in truth all brothers and sisters as sons and daughters of God, and we owe each other respect on that basis. And if that is not enough, we ought to try to live in peace together as residents of this planet. But I have difficulty understanding those antagonistic protesters. Do they go home at night telling themselves, “I served Jesus today by screaming insults at people and trying to destroy their faith”? The only way I can explain their behavior in my own mind is to realize that those people are haters, and members of my church happen to be their focus. If there were no Mormons, they would focus their hate on Jews, Muslims, African-Americans, foreign immigrants, Democrats or Republicans, or some other handy group. They simply need someone to hate—someone on whom they can focus their anger—because deep inside they are not right with God, and not even right with themselves. Their actions cannot be, either rationally or spiritually, the actions of people who follow a loving God. This cannot be Christianity—not as taught by Him who said, “Love one another” (John 15:17). What a sad, pitiful way to spend one’s limited time in this life—trying to destroy someone else’s faith instead of trying to demonstrate what it means to be a follower of God. This entry was posted in Culture, Faith and tagged bigotry, Christianity, freedom of religion, intolerance, Jesus Christ, Latter-day Saints, LDS, Mormons, Nauvoo, Nauvoo pageant, religious bigotry, religious freedom, The Church of Jesus Christ of Latter-day Saints on September 10, 2017 by Don L. Searle. What Are We Doing with Our Privileges? There is an incredible sense of privilege when we look back over the route we have just traveled. We have driven, more or less in reverse, the route our Mormon pioneer ancestors followed 167 years ago. The journey took them a little more than three and one-half months. We drove it in a day and a half. At freeway speeds on I-80 we covered in one hour about the same distance they covered in a week. We left Salt Lake City early on a Thursday morning and we spent Friday afternoon visiting the pioneer cemetery and the LDS Temple at Winter Quarters, in the suburbs of Omaha, Nebraska. As a boy, my father’s father drove the freight road in eastern Utah with his father, transporting goods from Price to the Vernal area. He told me that in a loaded wagon pulled by a team of horses, 10 miles was a good day. Today, we can drive the distance from Price to Vernal in a matter of hours. So sometimes it is hard to comprehend the obstacles our pioneer ancestors faced. Building on the efforts of pioneers in science, industry, and medicine over the past 100 years, we have created a world in which we are free to do things my grandparents could not have dreamed of. There is a temptation to indulge in old guy stories here: “I remember when we had to pick up a phone in the nook in our hallway and give an operator the number we wanted so she could connect the call.” I remember when we bought our first 512K Mac computer—allowing us to type electronically and play a few simple games—a generation ago now. My seven-year-old grandson, who has his own small tablet computer, cannot conceive that such a primitive world ever existed. But the point here is not that the world has changed. The question is: In a world with machines, devices, and systems that make it possible to accomplish so much more, what are we doing with our opportunities? Do we aspire simply to the same things our parents and grandparents hoped to do when so much more is at our fingertips? I no longer have to spend all day plowing or planting so that we have a crop for food in the winter. What, then, am I doing with my time? 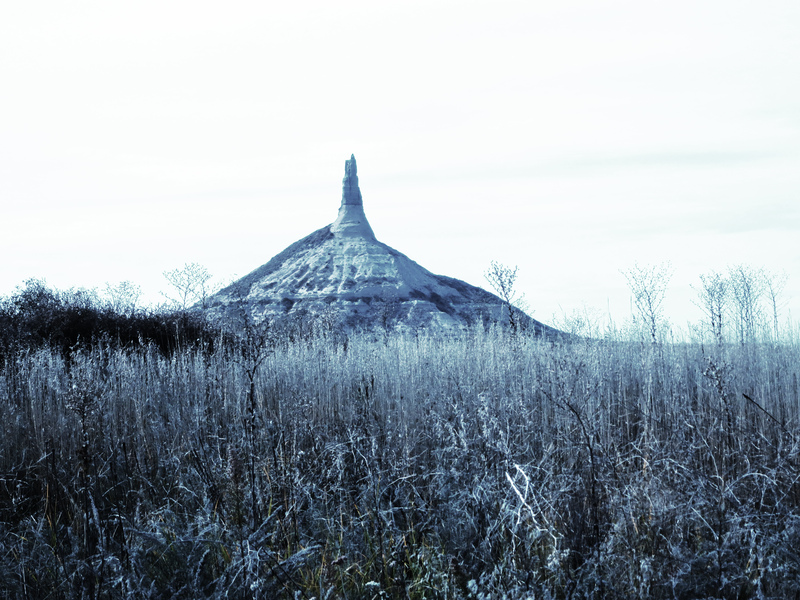 Since I do not have to spend time in another day of trekking across the Great Plains with my wagon, what is on the wider horizon? Can I perhaps spend my time on something that will benefit others? My wife no longer has to spend all day building a fire, heating water, scrubbing clothes in a tub, and hanging and gathering them on the clothesline. She spends a lot of her time serving others. Are we doing enough? Is there more I could do to put myself in tune with the infinite—or to be less vague, to learn my Heavenly Father’s will and do it? What would He have me do for others? Brigham Young, the second prophet and president of The Church of Jesus Christ of Latter-day Saints, once taught that most of us live far below our spiritual privileges. We could receive so much more of what God has to offer us if we were in tune with His Spirit. The great Christian writer C. S. Lewis taught something of the same thing in writing that God could make so much more of our lives, if only we would let Him. So the question we need to ask ourselves (or at least that I need to examine myself on daily) is: What are we doing with our privileges? This entry was posted in Culture, Faith and tagged Brigham Young, C.S. Lewis, God, Holy Spirit, LDS, Mormon, Pioneers, service on October 19, 2014 by Don L. Searle. Young woman wearing the skirt and typical hand-embroidered blouse of her region. You can see apprehension in her eyes—fear, perhaps, of what she might find or feel in the world beyond the mountains where she has grown up. But you can see determination in the fact that she is here, and in her willingness to meet new experiences. She will be the first woman from her area to serve an LDS mission. Even though she lives in a Spanish-speaking country, Spanish is fairly new to her. Her native tongue is the Mayan language spoken in her home area—Guatemala’s Polochic region. In front of a video camera, asked to talk about her reasons for being in this place far from her home, her limited Spanish fails her, and she needs an interpreter to explain. Never in her 19 years has she seen a dentist. There are none available to her in the Polochic. She is visiting this free clinic, staffed by dentists who are LDS missionaries, to have the dental work completed that she will need to submit her application to be a missionary. The dentists have brought their portable clinic to eastern Guatemala to treat prospective missionaries who otherwise might not be able to have their dental work done. After they treat the future missionaries, they will treat other members, and friends of members, from the community who are in need. Dental care is not something that can be so easily found here as it is in the United States. In the U.S., there may be one dentist for every 1,100-1,200 people. In Guatemala, it is one for every 11,000, and while excellent dental care is available here, the level of training among dental practitioners in outlying areas may not be high—if a dentist can be found. I have to admire the spirit of the young woman who left from her area at 4:00 in the morning, with a group brought by her spiritual leader, so they could arrive at this clinic by 9:00, receive treatment, and return home the same day. Not so long ago, it was common that women in her area might never learn Spanish, since it would be the significant males in her life—father, husband—who would interact with the dominant culture. But times have changed. A missionary tells me this young woman is learning Spanish to prepare for her mission, and studying the required missionary materials. I cannot help but admire that kind of spirit and determination. Her height is perhaps around four feet, ten inches—but she stands tall in my eyes. A generation or two ago, the indigenous population here was treated much as Native Americans have been treated in my own country—abused, reviled, ignored, punished if they dared to try to move out of their “place.” But much has changed here since the 1960s, when I was a missionary in Central America. The descendants of the Maya have claimed their right to education, they have gained political power, some have successfully moved into business. The world has begun to open up to them as they have opened up to its possibilities. Last night at the LDS temple in Guatemala city, I met a handsome young man with a Mayan surname. He seemed educated, knowledgeable, self-confident enough to live in and deal with the larger world. I do not know where he lives or what he does. But he seems to have blossomed as he sought to serve and learn. That is what I wish for the young sister from Polochic. This entry was posted in Faith and tagged Central America, faith, Guatemala, LDS, Mayan, missionary service, Polochic on April 18, 2013 by Don L. Searle. Much of the commercial and governmental activity of Guatemala has been shut down during Easter Week—Semana Santa, or Holy Week, as it’s called here. I could wish that we were so diligent in the United States about celebrating the importance of sacred things. Four of us LDS missionaries—two couples—went on Thursday to watch as hundreds of volunteers laid out carpets of colored sawdust on one of the principal downtown streets. They carefully painted pictures in sawdust honoring the sacrifice of Jesus Christ and depicting themes of their Roman Catholic faith. I suppose there are atheists and humanist here who may say this sort of activity is foolish. I know there are people who call themselves Christian who speak in critical and mocking terms of activities like this. I am not one of them. As we walked among the hundreds of volunteers on Sixth Avenue in the heart of the city, I struck up conversations with some of them. They were family oriented people, there to help their children participate, and to express their own faith. I express my faith differently, and if we had talked about doctrine, there would undoubtedly have been points of disagreement. But I had to admire the devotion and dedication that went into their way of paying homage to the Savior. Whether or not I agreed with the themes expressed in those sawdust pictures, it was heartening to see so many people readily identifying themselves with Christian faith, and doing something to show it. I would much prefer to live in a community where faith is openly expressed than one where it cannot be freely acknowledged—even where the faith tradition is not mine. Government and, to a large extent, commerce close down Wednesday though Friday of Semana Santa. 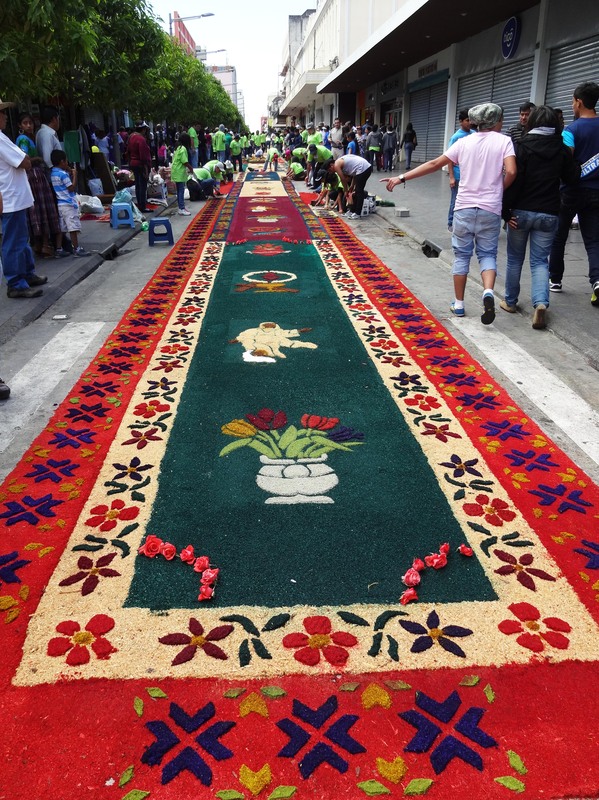 City governments cooperate by blocking streets where the sawdust carpets are to be made. Volunteer municipal workers haul bags of sawdust in city trucks. Guatemalan Scouts—boys and girls—mix together in these activities. Many young people are enthusiastically involved. Is it more social than religious? Undoubtedly there is a social element in much religious participation; maybe we get involved in religious activities because our friends do. But I’d like to think that a majority of those people got involved as a way of expressing their faith in God. One man I met, a well-known television journalist, is an evangelical Christian married to a faithful Roman Catholic. He was there supporting his wife and children in the activity. Has their marriage been difficult, I asked, because of their religious differences? They thought it would be at first, he answered, but things haven’t turned out that way. They don’t have conflict because their family is built on love. Perhaps we who are members of the family of God should try harder to make our relationships work the same way. After all, when my evangelical friend, his wife, and I go to our churches this Easter Sunday, we are all going to be worshiping the Jesus who brought about the Atonement for us because he died for our sins and was resurrected so that we all may live again. 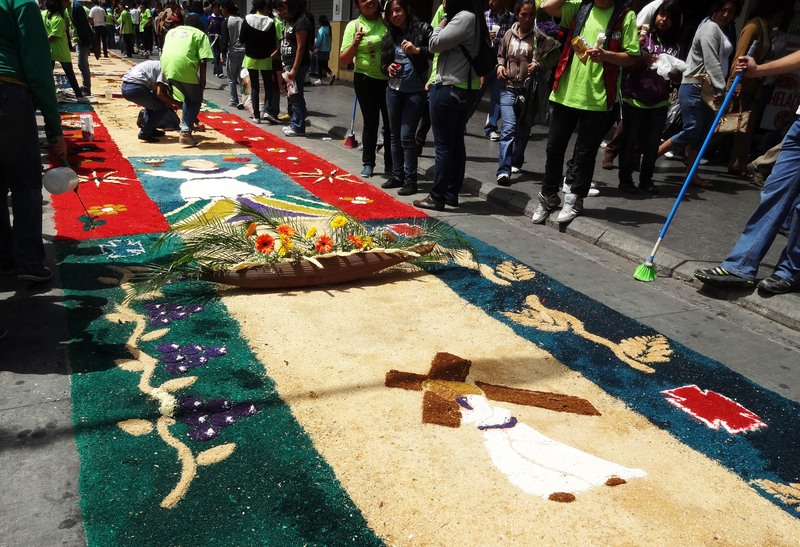 This entry was posted in Faith and tagged Catholic, Easter, evangelical, faith, family of God, Guatemala, human-rights, LDS, religion, sawdust carpets on March 30, 2013 by Don L. Searle. We spent Wednesday evening at the nicest mall we’ve seen anywhere in the world. There are touches of luxury everywhere, beginning with the red or green lights above the underground parking spaces to show empty stalls. Name a brand of expensive wristwatch or sportswear and you can probably find it here. Models in off-the- shoulder mini-dresses distribute samples of expensive perfumes or gourmet chocolate. People who are used to shopping at Saks 5th Avenue or on Rodeo Drive in Beverly Hills could feel at home in this place. It is a palace of conspicuous consumption. In the movie theater, there are plush recliner seats similar to those in first class on an airliner. The popcorn is cheaper than in theaters at home—but we order from our seats, and it is delivered by a dark-suited waiter. If your life were dedicated to acquiring things or treating yourself to pleasant experiences, it would be easy to think that heaven ought to be like this. In contrast, on Saturday, Sister S. and I had the privilege of joining a group of evangelical Christians as they distributed clothing, blankets, children’s toys, and food to people who live in the Guatemala City landfill, a ravine below the city cemetery. Each day these people dig through heaps of garbage to eke out their subsistence by salvaging repairable or recyclable items from the trash. The largest flock of buzzards I have ever seen circles overhead like seagulls over a hoard of picnickers at the beach. The scene reminds me of one of Dante’s circles of hell—but it is all too real, all too concrete. No words or photos can capture the unrelenting stench of decay or the feel of grit in your teeth from the fine dust that swirls in the winds of this ravine. Some 1,500 people lined up to receive gifts and a light lunch of a roll, a Guatemalan tamale wrapped in a banana leaf, and a glass of punch. The visitors who brought the gifts were mostly Guatemalans, but they also included a visiting family from Iowa and a handful of LDS senior missionaries from all over the United States, with visiting family members in tow. Gifts were donated by both businesses and individuals; several hundred of the blankets were provided by LDS missionaries. The group brought along a generator, portable sound system, and keyboard. A talented musician spent the hours in the landfill singing Christian pop music, trying to spread a bit of the word about Jesus. At the edge of the crowd, a man in tattered clothing and what might have been dreadlocks (or maybe only matted hair) danced along. My wife and I went home to enjoy long showers—and felt a little guilty just for having the privilege. We have to admire people so dedicated to helping the least fortunate among us. Members of the Guatemalan group sponsoring the activity, la Asociación del Cinco, have pledged to donate five percent of their income to helping the poor. But what is the best way for us to help people so poor? What’s the right answer? I don’t know. But surely there has to be some viable middle ground. Those who work most closely with people at this level of poverty say the answer isn’t simply to give them money. It’s spent too fast, with no lasting result. Education may well be the answer—in the long run. There’s a public school perched on the edge of the ravine that serves the children of the area. By law children and teens are no longer allowed to work in the landfill with their parents; they should be in school. La Asociación del Cinco also has a school to help some of the children eight to 12 years old. Human nature being what it is, there are undoubtedly some at the dump who would not take advantage of an offer of help if it required long-term commitment. But could there not be some system worked out to help those willing to train for viable jobs? Perhaps instead of paying back the aid they receive, they could pay it forward, helping finance retraining for others. It seems like an idea worth a try. I for one would support it. In the meantime, those who are sacrificing every day to help people trapped in poverty—people condemned to live in the dump—have all my respect. This entry was posted in Culture, Faith and tagged Christian, Dante Alighieri, Guatemala, Guatemala City, Israel, Jesus, LDS, Missionary (LDS Church), Rodeo Drive, United States on December 24, 2012 by Don L. Searle.